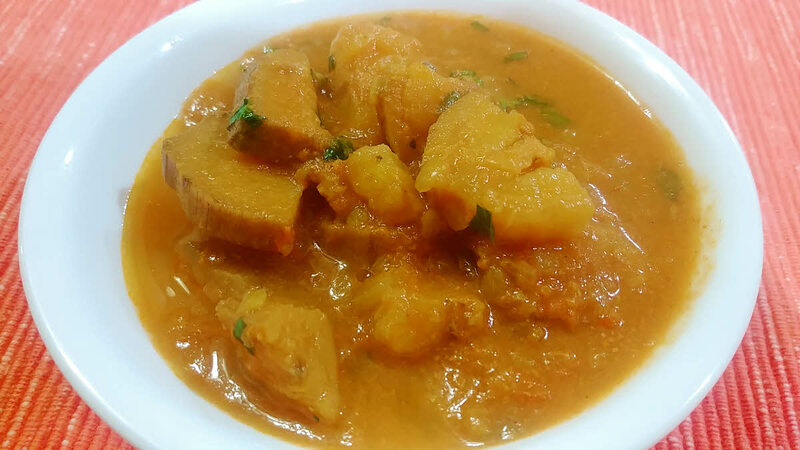 Kachche Kele Ki Curry (Plantain Curry) is one of those homemade dishes, which you will never find in restaurants. Like most homemade recipes, it’s real easy to make and tastes great. Plantains are high in fiber, potassium and vitamins A and C so it’s healthy too. Peel the plantains. If you like, leave a thin layer of peel on the plantains. I have removed the peel fully. Chop it roughly in half centimeter thick pieces. Chop the onion finely. Blend tomatoes in a mixer. Heat oil in a pressure cooker and add asafoetida and cumin seeds. Wait till cumin seeds crackles and then add onions. Saute till they start to become brown. Now add rest of the spices except garam masala and fry for a few seconds till they are fragrant. Add blended tomatoes and cook on medium heat till their water is almost all evaporated. Add plantain pieces and 3 cups of water. Close the pressure cooker and cook on high heat. Once it whistles, lower the heat to low-medium and cook for another 7 minutes and then turn off the heat. Open the cooker once the steam dies down and add garam masala. Add more water if required. Garnish it with chopped cilantro and Plantain Curry is ready to serve.